Hi Mist. s I have only been blogging for 10 months I am pleased to see this lovely bird in those surroundings. HAPPY NEW YEAR to you. Pretty Purple Finch.. Thanks for hosting Camera Critters..Happy Weekend! Wonderful bird shot. Lovely contrast. Happy New Year, wish u the best year. wow just the right patch of color !! I saw you over at camera critters ~ so glad I stopped by. That wonderful photo was very much worth repeating ~ beautiful ! Beautiful Purple Finch photo. 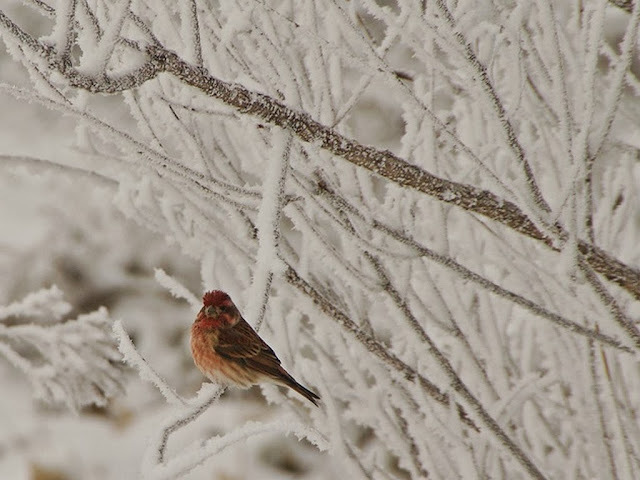 I really like the contrast between the colorful bird and the frost. Well done! Great image, Misty. I agree totally with Ashrunner. Superb contrast as the frost really compliments the color of the finch. Gorgeous, it looks like a Christmas card! Beautiful spot of color on the snow-coated branch. That's a great shot! I've been having a hard time getting out to take any photos this winter with the horrible cold. Hope you are staying warm!